How many strides make it great? I take great joy in watching Sophia run– whether she’s playing ‘Monsters’ with Simon and running around the loop in our house, or racing her friends to the finish line. 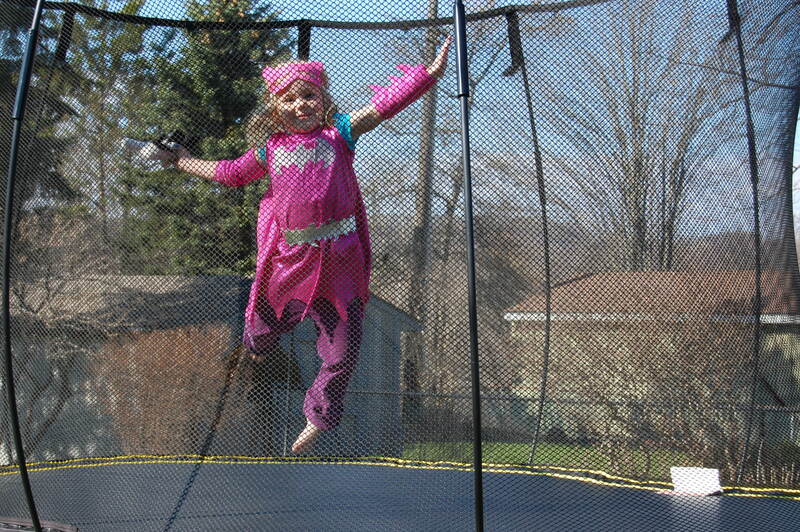 I’m often asked by medical professionals if Sophia can keep up with her peers. It would be fun (in an academic geeky kind of way) to hook Sophia and her friends up to O2 Sat machines and stick them on treadmills and see how long they could run. Maybe I could use candy dangling just out of reach as a motivator. And exercise-powered TVs in front of them playing Dora the Explorer. I’m thinking I might have trouble getting this idea past the ethics board. So, using just my eyes as a judge, I’d have to say that ‘yes,’ Sophia can keep up with her peers. Coming up at the end of May, our family and friends will be participating in the Great Strides™ walk for Cystic Fibrosis. This is a 5km Walk or Fun Run. I like this event because it’s all about gathering your loved ones together, and having fun in an outdoorsy exercising sort of way. While this may be a ‘walk in the park’ for many of us, taking 7576 steps can seem nearly impossible for those who struggle to breathe. When I think of it that way, keeping myself motivated to help find a cure is easy. 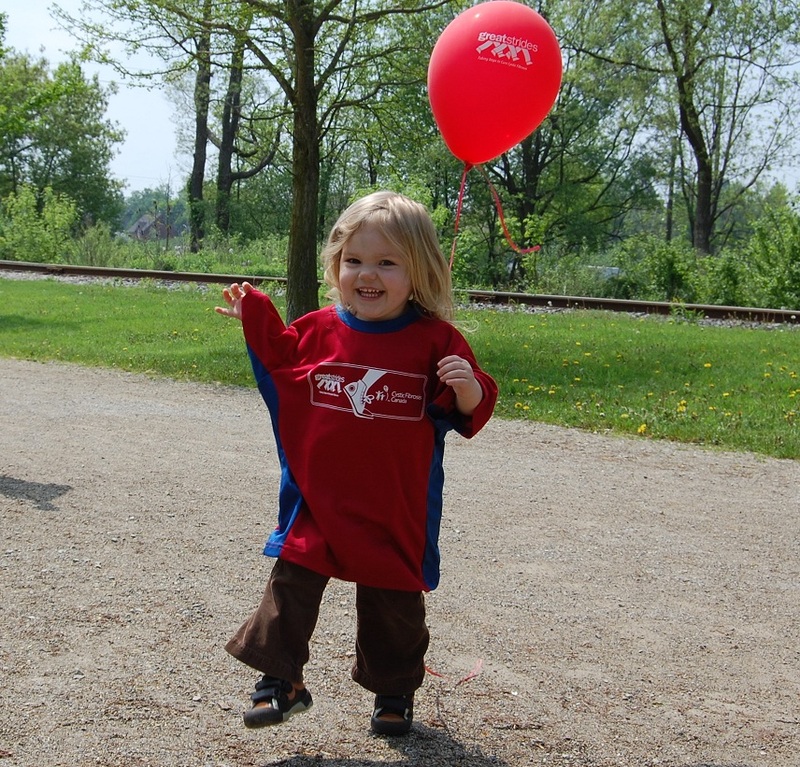 In the past 4 years team Zoom Zoom has raised nearly $100,000 to help fund research and clinical programs via Cystic Fibrosis Canada. Last year alone we raised a whopping $36,000 and I hope to surpass that this year. If you haven’t gathered from previous posts, I’m a wee bit competitive. What better way to channel my energy than through fundraising to help make my little girl’s life better? Check out our new Video (Video 2013 at the top of this screen), and feel free to get into the spirit and donate (convenient link can also be found at the top). Every penny counts. Thank you! Tags: CF, cystic fibrosis, exercise, Great Strides | Permalink. Every once in a while I like to challenge myself. Those of you who know me well are probably smirking, thinking ‘yeah, she’s a little crazy sometimes.” Over the years I have made fast decisions about intense physical challenges. I am usually whole-heartedly committed before I really have a chance to think. Some examples that come to mind: running a half marathon, 5-Peaks cross country races, adventure races (8 hours of biking, orienteering/running, and paddling), orienteering races, backcountry camping/hiking the Long Range Traverse in Gros Morne National Park for my honeymoon (multi-day adventure with only a compass, no marked trails). I have rarely trained properly for these events, but am able to get through them on pure mental determination and adrenaline. At the end, I always feel an incredible sense of accomplishment. The endorphins feel pretty awesome too. Jason and I have completed a few races together (and of course our honeymoon), and I feel closer to him and more amazed by him every time we cross a finish line together. I am healthy. The biggest obstacle I have to face is my weak muscles. I have nothing to complain about. There are thousands of people out there with cystic fibrosis who are struggling to take each breath. I have no excuse not to do this race. Even though Sophia will likely face challenges with her lungs, there’s a chance they may not limit her. I recently read about a woman named Lisa Bentley who has cystic fibrosis and has WON 11 Ironman competitions (check out http://www.lisabentley.com). That blows my mind. Tags: CF, cystic fibrosis, exercise | Permalink. 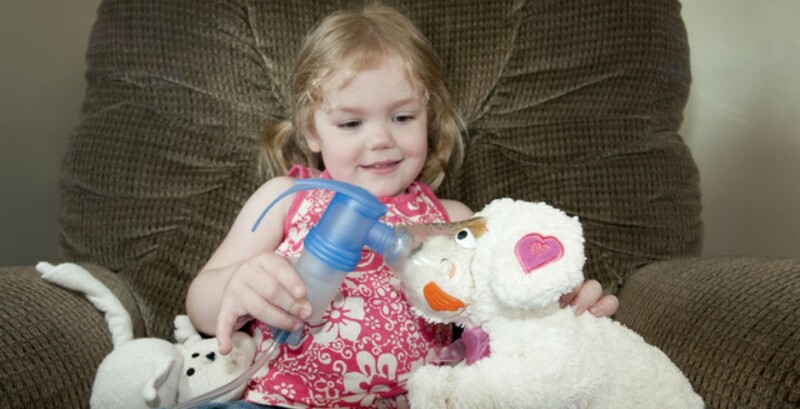 When we found out that Sophia has cystic fibrosis, some of my first questions were about physical exercise. Would my daughter be able to participate in gym classes? Would she have the endurance to go on long walks? Would she be able to keep up with her peers and play sports? The answer to all of those questions was an emphatic ‘yes’! But in small print, at the top-right-corner of that ‘yes,’ was an asterisk. I could hear it in the medical professional’s voice. “Well, she’ll never get to the Olympics, but she can and should play sports for her physical and lung health” was the explanation at the bottom of the page. Having just watched 16 days of Olympics with Sophia, I started thinking about that remark. I heard it three and a half years ago, but it still echoes in my mind. Could Sophia make it to the Olympics? How big should our dreams be? Do my own thoughts need to have asterisks? I don’t know. But what I have figured out is that sometimes my thoughts have caveats hidden behind them. Like the bunny that hides in the clover in the middle of my backyard, these stipulations were quietly waiting to be discovered. Instead of allowing these asterisks to drag me down, I think I’ll expose them for what they are. They are unknowns. I will not allow them to stifle dreams. When Sophia and I were watching various sports she showed me how fast she can run, how high she can jump, and how far she can throw. You go girl!